There are a lot of people who want to do something for God. I was like that. When I was 18 years old I stood up on a make-shift soapbox and delivered my first open air sermon. I'd like to talk to you about why I did that. If you were to ask me at the time why I did that, I would probably have answered you something like this: "God has called me to preach His word. I do this I out of love for the lost and for the glory of God. We must preach the gospel to a lost and dying world!" This, of course, would have been partly true. On the one hand, I know today that I was indeed called to preach the gospel, and the desire of my heart to serve God and my neighbor was real and sincere. But on the other hand, I hardly knew what it was to love the lost and to glorify God (though I thought I did), and I thought that God needed my services. Let it be known to all those who desire to serve the Lord: a calling itself is not enough: there must be a preparation in the one that is called, a spiritual maturation within the heart whereby the one who is called is utterly persuaded of his natural inabilities and of the impotency of his flesh (that which issues out of self) to procure anything of value for God, so that he comes to solely rely upon the Spirit of God that is within him to do the work for which he's been called. In the Old Testament, consider Moses. Moses knew that he was called to deliver Israel from the tyranny of the Egyptians, and he thought everybody else knew it too. "For he supposed his brethren would have understood how that God by his hand would deliver them." (Acts 7:25) Moses was called, but he was not prepared. At 40 years old he was "mighty in words and in deeds" according the flesh, but at 80 years old he was "mighty through God to the pulling down of strongholds" according to the Spirit. God Himself dealt deeply with the heart of that dear saint through forty years of solitude and failure, withering up the fleshly confidence he had within himself that clung so deep. When God finally sent Moses forth to fulfill his calling, Moses' answer was: "O my Lord, I am not eloquent... I am slow of speech, and of a slow tongue." (Exodus 4:10) So withered was he, that he was even reluctant to fulfill his original calling! There was no more confidence in his flesh. So it is that the men whom God uses to do the greatest things for heaven are first the "meekest men on earth". In the New Testament, consider Peter. Peter had received one of the highest callings a man could receive from the Lord: "And I say also unto thee, That thou art Peter, and upon this rock I will build my church." (Matthew 16:18) He would be one of the great pillars and shepherds of the Church, the flock of God, but first he had to undergo a severe humbling in self-realization. Wanting to do something for Jesus, Peter, in the power of the flesh, vowed, not to deny, but to die with Christ that climactic night of nights. What ended up happening? He slept during the very hour Jesus needed him most, was rebuked for nearly killing somebody, and betrayed the Lord of glory three times, with a curse. He was a complete failure. "Peter went out, and wept bitterly." 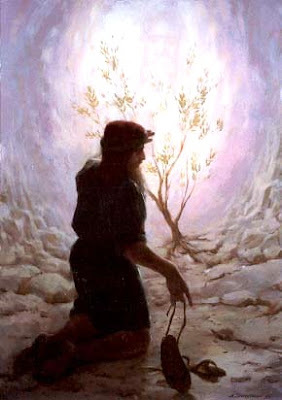 (Luke 22:62) He went out: out from a high opinion of himself into the depths of humiliation and helplessness; out from the notion of spiritual heroics into the realm of spiritual dependency; out from the confidence he once had in human willpower and strength into the place of weakness where God's strength is made perfect. When the day of Pentecost had fully come, Peter was fully prepared to fulfill his calling (though he may not have felt so), as one whose flesh had been thoroughly dealt with by God. So why did I do what I did? I was going to do something for God: "This world is going down, but not me! I'll stand up for truth even if nobody else does! I will serve you, Lord!" Called? Yes. Sincere? Yes. Prepared? No. God uses our failures to bring us to a new place of maturity in Christ. It is the flesh that must die for the glory of the Lord to be revealed, and there's no greater weapon against the flesh than failure. When God lets us in on just who we are apart from Him, so that we shrivel up and die like a branch detached from the life of the vine, then are we ready to receive that power that comes from on high, the power of Christ's resurrection which issues out of the place of death. "Not by might, nor by power, but by My Spirit, saith the Lord of hosts." (Zechariah 4:6) It is there that God alone gets all the glory; and it is there where our Christianity ceases to be the wisdom of man but the power of God. All spiritual service is "of Him, and "through Him", and "to Him", to Him be all glory forever (Romans 11:36). God must destroy in us that which is inherently contrary to His glory that He might fulfill in us the works which He has called us to walk in. Can we say with the Apostle Paul, "But by the grace of God I am what I am: and his grace which was bestowed upon me was not in vain; but I labored more abundantly than they all: yet not I, but the grace of God which was with me." (1 Corinthians 15:10)? Our God is jealous for His glory, and He will produce in us that same jealousy, for He will only move among those who are jealous for the same. Let us learn this lesson of grace, and submit our flesh to be thoroughly dealt with by God, that we might grow up into Christ, and fulfill the works which God has called us to do. Amen.